A bed sheet is a flat-woven textile that is used on a bed between the occupant of a bed and the warm blanket above. It is generally a rectangle of broadloomed fabric, meaning it is made without a center seam. Bed sheets have hems at top and bottom. The selvages, or finished edges of the woven sheet as it is made on the loom are used as side seams and thus there is no need for hemming on the sides. Today, the bed sheet comes as part of a set of bed linens that match in color, fabric, and detail and includes the fitted sheet (to cover the mattress), the flat sheet and at least one pillow case. The bed sheet may be made of a variety of fibers, including linen, cotton, synthetics (often blended with natural fibers such as cotton) and occasionally silk. Bed sheets are made of a wide variety of fabrics. Particularly popular is percale, a closely-woven plain weave of all cotton or cotton-polyester blend that is smooth, cool, and comfortable against the skin. Also of plain weave but more coarsely woven than percale is muslin. In winter months flannel sheets, which are woven with nappy cotton fibers, provides additional warmth. Silky, satiny bed sheets, generally woven of synthetics (silk is very expensive) are a novelty. Linen is also occasionally used for bed sheeting but is not generally commercially available in this country as linen is not processed in the United States. Linen sheeting is either imported from Eastern Europe or Britain. Beds of some sort have been around for millennia. It is unknown when sheeting was first used to keep the sleeper comfortable but it is likely that the first true bed sheets were linen. Linen, derived from the flax plant, has been cultivated for centuries and was expertly cultivated, spun, and woven by the Egyptians. It is a laborious plant to cultivate but the finished fabric is perfect for bed sheeting because it is more soft to the touch than cotton and becomes more lustrous with use. Linen sheeting was made on conventional looms that were between 30-40 in (76.2-101.6 cm) wide, resulting in bed sheets that had to be seamed down the center in order to be large enough for use. Europeans brought linen culture to the New World; linen processing flourished in the Northeast and Middle Colonies for two centuries. However, because of the painstaking cultivation process, linens were difficult and time-consuming to make. Nevertheless, many seventeenth, eighteenth, and early nineteenth century American women worked relentlessly producing linen goods—pillow cases, bed sheets, napkins, towels—for family use upon their marriage. By about 1830 in the United States, cotton cultivation and processing was becoming well-established. Previously, it was difficult to remove the tenacious seeds found in short-staple cotton which grows easily in the American South. Eli Whitney's development of the cotton gin enabled the seeds to be stripped from the cotton wool easily and quickly; southern plantations immediately began growing the now-lucrative plant using enslaved labor. At the same time, New England textile mills were quickly adapting British cotton manufacturing technologies and were able to spin, weave, dye, and print cotton in huge quantities. By about 1860, few bothered to make bed sheets from linen anymore—why spend the time when cotton sheeting was cheap and easy to obtain? Cotton fibers are produced from bales of raw cotton that are cleaned, carded, blended, and spun. Once loaded onto a section beam, the bobbins are coated with sizing to make weaving easier. Several section beams are loaded onto a single large loom beam. As many as 6,000 yarns are automatically tied onto old yarns by a machine called a knotter in just a few minutes. Looms became more mechanized with human hands barely touching the products and bed sheets have been made on such looms since the later nineteenth century. Recent innovations in the product include the introduction of blended fibers, particularly the blending of cotton with polyester (which keeps the sheet relatively wrinkle-free). Other recent developments include the use of bright colors and elaborate decoration. Furthermore, labor is cheaper outside the United States and a great many bed sheets are made in other countries and are imported here for sale. Today, the southern states, particularly the state of Georgia, includes a number of cotton processors and weavers. Many of our American cotton bed sheets are produced in the South. If cotton is to be spun into yarn in the bed sheet manufactory, 480 lb (217.9 kg) bales are purchased from a cotton producer. This cotton is often referred to as cotton wool because it is fuzzy like wool. It is still dirty and includes twigs, leaves, some seeds, and other debris from harvesting. Other materials used in the weaving process include starches or sizing of some sort that is applied to the cotton threads to make them easier to weave. During the cleaning and bleaching process after the sheet has been woven, caustic chemicals and bleaches including chlorine and/or hydrogen peroxide solutions are used to remove all color before dyeing. Dyeing includes chemically-derived dyes (meaning they are not natural and not found in plants or trees but are created in laboratories) are used for standard coloration and color-fastness. Some manufacturers spin the bales of cotton delivered to the manufacturer. Others purchase the yarn already spun on spools. 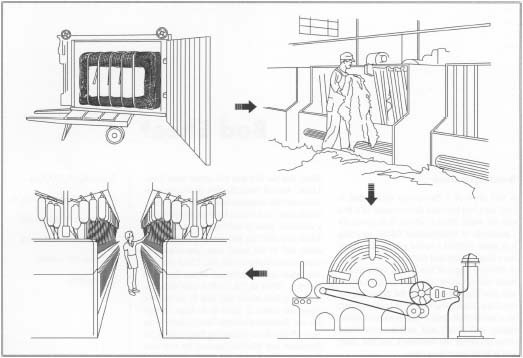 This section will describe the process of making 100% sheeting from bales of cotton delivered to the plant which are not yet spun. 1 Bales of cotton weighing about 480 lb (217.9 kg) are purchased and shipped to the sheeting manufacturer. 2 Bales are laid out side by side in a blending area. The bales are opened by a Uniflock machine that removes a portion of cotton from the top of each bale. Next, the machine beats the cotton together, removing impurities and initiating the blending process. The fibers are then blown through tubes to a mixing unit where the blending continues. 3 Once blended, the fibers move through tubes to a carding machine, which aligns and orients the fibers in the same direction. Cylinders with millions of teeth pull and straighten the fibers and continue to remove impurities. 4 Here, the cotton fibers are further blended together and straightened as many strands of fibers are drawn together into one strand by a roving frame. The frame twists the fibers slightly and winds a cotton roving onto bobbins. 5 The rovings are spun on a ring spinner, drawing the cotton into a single small strand and twisting it as it spins. The yarn is then wound onto bobbins and the bobbins are placed onto winders that wind the thread onto section beams that will eventually fit onto a loom for weaving. 6 It takes between 2,000-5,000 warp (lengthwise yarns) to make up a single width of sheet. Thus, the warping beam, which holds all of the yarns, is very large and cannot be loaded at once. So 500-600 ends of yarn from spools are pulled onto a single section beam, thus warping it. Later, several section beams will be loaded onto the large warping beam, each contributing a portion of the warp. 7 Each section beam goes through a slasher—a machine that coats the yarn with starch or sizing to protect the ends and makes the yarn easier to weave. 8 Once coated with sizing, several section beams are loaded onto a single large loom beam. As many as 6,000 yarns are automatically tied onto old yarns by a machine called a knotter in just a few minutes. The knots are pulled through the machine and the weaving can begin. 9 The weaving, in which the weft or filler threads interlock with the warp or vertical threads, is done on high-speed automatic air jet looms. The filler threads are transported across the warp threads at a rate of 500 insertions per minute, meaning that a filler thread runs across the warp thread about every one-tenth of a second. It takes about 90 insertions to weave an inch of sheeting. Thus, about 5.5 in (14 cm) of sheeting is woven per minute—10 yd (9.14 m) per hour are woven. Typically, 8,000 yd (7,312 m) of sheeting is woven on a loom and wound up in rolls and shipped for further processing. 10 The fabric, called greige, is gray in color. It is further finished by singeing—a process in which bits of yarn are burned off of the surface. Then, the sheeting is ready to be bleached. This is done in three steps. First, it is desized by bathing it in water and soaps that removes contaminants. Next, caustic chemicals are applied to get rid of dirt and remnants of debris found in cotton yarn. The caustic is washed out and concentrated bleaches (chlorine and/or hydrogen peroxide) are applied to dissipate the gray color. Now whitened, the sheeting is rolled into a rope and put into a dryer which takes the moisture out prior to dyeing. Weaving is done on high-speed automatic air jet looms. Typically, 8,000 yd (7,312 m) of sheeting is woven on a loom and wound up in rolls and shipped for further processing. Once woven, the sheeting is bleached, rolled into a rope and dried, dyed, and rolled. Automatic cutting equipment cuts the roll into standard sheet lengths and the sheet hems are sewn. 11 All sheeting is dyed. Even sheeting sold as white must be dyed to become a truly white sheet. In order to give the gray-colored sheets color, pigments are applied to the sheeting in color vats that use large rollers to press the dyestuff into the material. Once dyed, the sheeting is steamed to set the color. Next, a resin is applied to the sheeting to control shrinkage. The sheeting is rolled onto huge rolls and is ready to be cut and sewn. 12 Automatic cutting equipment pulls the cloth off the rolls as it automatically cuts the sheeting to the requisite length. The rolls are transferred to a sewing machine that sews top and bottom hems. 13 The sewn sheet is either folded by 1 3 hand or machine. Machine-folded sheets are ejected, shrink wrapped, and individually packaged for sale. Sheeting manufacturers carefully choose cotton bales. Cotton is classified by length (staple) and by quality (grade). Shorter staples are used for batting, while longer staples are used to make higher quality products. Egyptian cotton is made from longer staples. Medium staples is considered standard. There are nine grades used to classify cotton from middling to good. Cotton with much debris and residue would be of a lower grade than that with less impurities. The lower grade bales tend to slow down the processing of the cotton into spool yarn and may never render a quality product. Thus, many plants will purchase bales based on test data received from the U.S. Department of Agriculture to ensure the bales are fairly clean. Many weaving facilities perform their own tests on bales to be purchased to assess quality and cleanliness. Rovings—the rope-like strand that is spun into yarn—generally undergoes quality control inspection prior to spinning. At major points in the production of yarn and sheeting, statistical samples are taken and tested in the laboratory. Physical tests are run on the completed products. Because the bleaching and dyeing processes include a number of chemicals that must be mixed exactly, the chemical solutions are monitored. Furthermore, employees within the plant carefully monitor the process and visually inspect the product at each manufacturing stage. Cotton weavers have worked diligently in recent years to reduce polluting effluvia and cotton lint. Occasionally, fiber wastes resulting from spinning can be recycled and used for other cotton products. In the past, cotton lint generated inside factories was hazardous to the employees; however, now the air-jet looms generate little cotton dust. At the point in which greige goods are handled, there are automatic sweeping and cleaning machines to rid the rooms of ambient dust. Of greatest concern to the federal government are the chemicals used in the cleaning, bleaching, and dyeing of the goods. Federal regulations require that resulting liquids emitted from the factory (which may contain chlorine, hydrogen peroxide, and other miscellaneous caustics) meet state and federal clean water regulations, and mills are required to have National Pollutant Discharge Elirnination System permits. The larger mills have invested in building their own wastewater treatment plants. Emissions are now governed by the Clean Air Act and must be within acceptable guidelines. Walker, Sandra Rambo. Country Cloth to Coverlets. Lewisburg, PA: Union County Historical Society, 1981. National Council on Cotton. 1996-1999. Linen Association. 1996. http://www.lin.asso.fr/ (June 22, 1999). This article says that a (flat) bed sheet has selvages at the sides, while the top and the bottom are hemmed. In my experience, this all changed sometime in the 1980s, when the sides began to be hemmed. Sometimes the bottom of the sheet would be a selvage, but sometimes there would be no selvage at all. I would like to learn more about the technological changes that occurred at that time. My guess is that, prior to the change, fabric for each size of flat sheet was woven on a different loom, so that four looms were needed to produce twin, double, queen, and king size sheets. Then, beginning in the 80s, fabric for flat sheets began to be woven sideways and hemmed on the sides so that only one size of loom was needed.